This weekend I was in DC. On Saturday morning, I thought I’d take a stroll over to Georgetown to visit the site of Southworth’s house on Prospect St. and to see her gravestone in Oak Hill Cemetery, since I hadn’t paid a visit in about a decade. The cemetery, in the northeast corner of Georgetown, is home to many important figures from the nineteenth and twentieth centuries, including Secretary of War Edwin Stanton, “Home Sweet Home” songwriter John Howard Payne, a number of Civil War generals and Confederate spies, and Washington Post editor Katharine Graham. Jefferson Davis’s grave was even there until 1893. 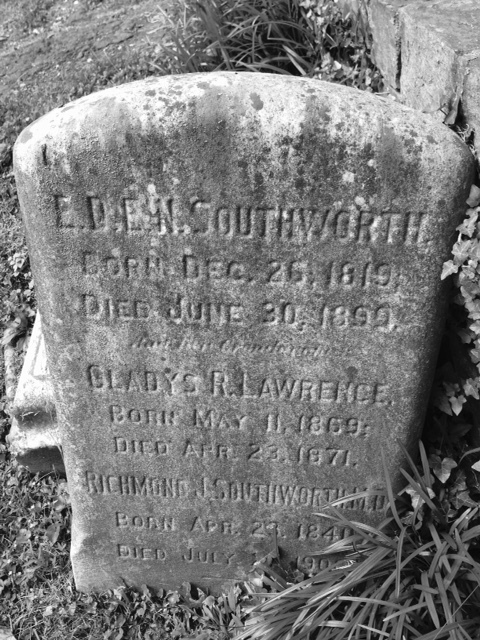 Southworth’s grave marker in Oak Hill Cemetery in Georgetown, DC. June 2015. I thought I’d present items from my personal collection of Southworthiana from time to time as a feature on the blog. I’ve been collecting Southworth material since the mid-1990s, starting with various editions of her novels (mostly discovered in antique shops and from internet sites like Abebooks), which I now have boxes and boxes of in my house. While editions of her books still catch my eye (just the other day I found a copy of Old Neighborhoods and New Settlements, her 1853 short story collection published by Hart, on ebay), I’ve mostly been searching for other types of items–autographs, letters, and other ephemera–in recent years, and I’ve been lucky to acquire some interesting things. 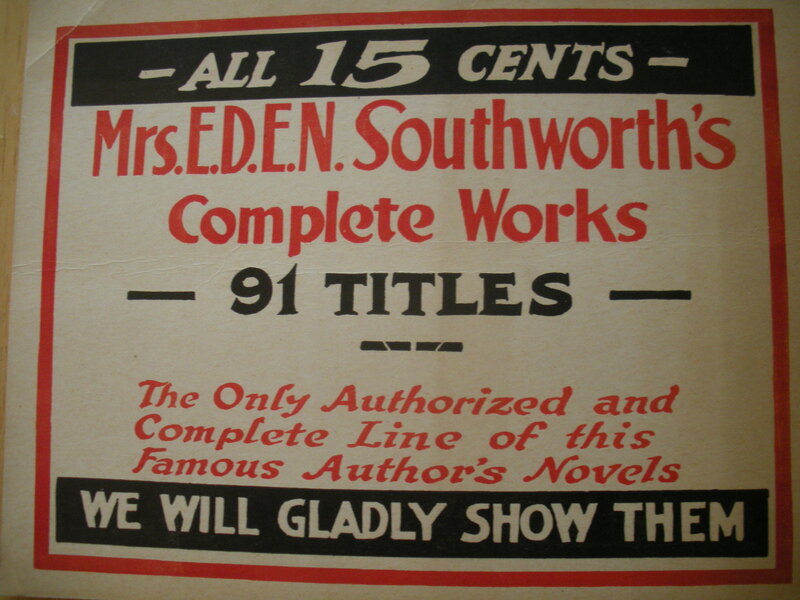 One interesting acquisition was this booksellers’ signage for the Street and Smith paperback editions of Southworth’s novels from the 1910’s. Mrs. Southworth at the Movies? Considering the popularity of Southworth’s works on the stage from the late 1850s to the early decades of the twentieth century, it seems likely that some of her works would have also been used as the basis of films in the earliest decades of film-making. So far, my searches have only turned up one such film, the 1921 Fox Film Corp. film, Hearts of Youth, which is an adaptation of Southworth’s Ishmael novels. 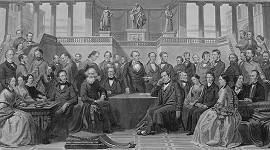 I’ve long been intrigued by Southworth’s inclusion in “The Authors of the United States,” a popular 1866 print by Thomas Hicks (engraved by A. H. Ritchie). "Authors of the United States"
While Southworth’s relationship to popular nineteenth-century theater has not been explored in any depth by American literary historians (dissertation topic, anyone), many of her works were adapted to the stage beginning in the late 1850s and throughout the rest of the nineteenth century. 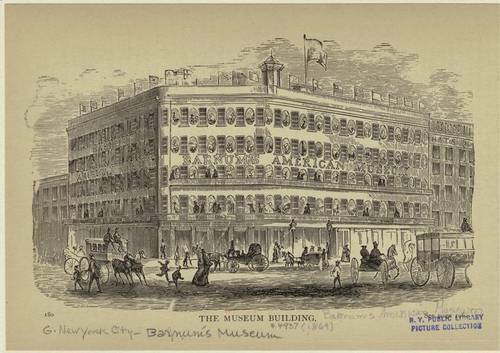 Among the earliest to adapt her work was Harry Watkins, who staged Bride of an Evening (the New York Ledger serial that would be published in book form as Gipsy’s Prophecy) at Barnum’s Museum in New York City in 1858.